Members of the M3P team – from left Dr. Michael Sadowsky, project director, Dr. Christopher Staley, postdoctoral fellow, and Trevor Gould, researcher – hit the shores of the river to collect samples for testing. 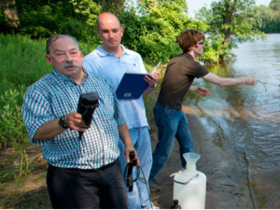 University researchers working on the M3P project periodically collect water samples at 11 different locations along the Mississippi River in Minnesota. The sites range from the river’s headwaters at Itasca State Park to near the Minnesota/Wisconsin border in La Crescent. Back in the lab, the water undergoes analysis for a wide variety of chemicals and human related products. The levels are compared to standard thresholds of acceptable water quality maintained by the World Health Organization and the Environmental Protection Agency. Click here to see a map of the testing sites, and the levels of different chemicals found at each site. But that’s not all. Go to the next page to learn how metagenomic information is collected from the same samples.